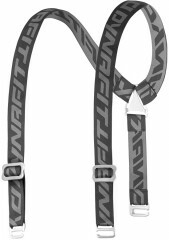 If you have trouble keeping your pants up or need more places to hang your skins while skiing, check out the Dynafit Suspenders. The elastic straps are compatible with 2015/16 and later Dynafit pants and can be adjusted to your height and/or girth. One strap in back helps prevent plumber crack. Two straps in front match the number of skins you probably have. The suspenders come in three fabulous colors and weigh 66 grams (2.3 ounces). Works with Mercury, Chugach, Aeon, Patrol, Yotei and other pants. Does not work with Radical, TLT, and PDG models. How wide are the S clips? was thinking of purchasing these because my Patagonia pants have the loops, but can't find anyone that sells compatible suspenders, other than these. Hi Gagan, the clips have been changed this season to be plastic with a locking mechanism. They are 27mm wide internally. How do these attach to pants? I am trying to put them on Mercury Soft-shell pants but not clear how the little hooks are supposed to hook on? Do you double the suspenders back through the rubber loops on the pants and attach them to themselves? Hi Aaron, for current season Mercury pants, there are sewn in attachment loops. For prior editions, it should work to use the double back technique. Thanks - are the attachment loops the rubber ones? They don't seem quite robust enough. Can you post a picture? The loops look like this. Pictured is a rear connector on the Aeon pant.